Some of you may have noticed a new member, fluffynat, has been having with issues with his K100. Some suggestions were made but I think he was losing the will to fix it. A few mentioned that they hoped it would find a good home. Just on my way to collect it. It's had a hard life but is all there bar the right side panel. Still has the radiator surround and a K75 handlebar fairing. Pics later. Is there no end to this madness!! Is this what you have to stoop to to get people to talk to you on this forum? 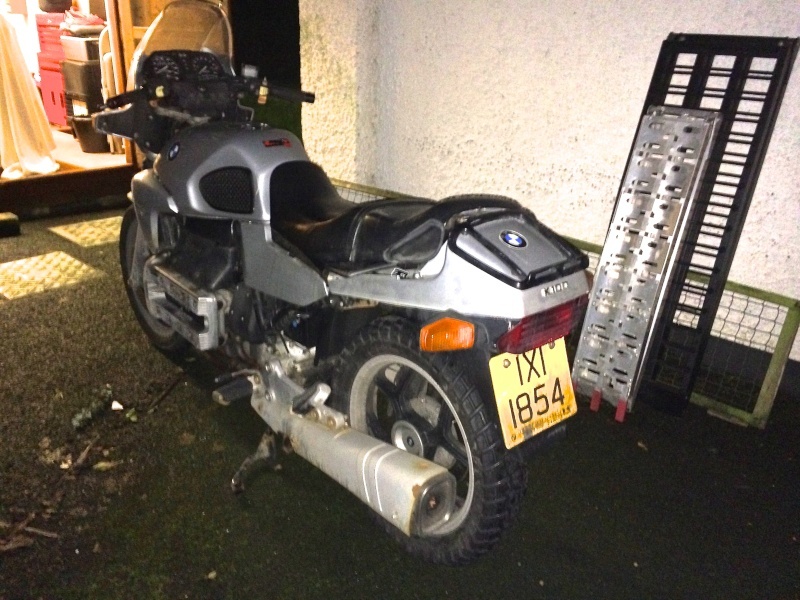 No, Olaf, I'm not getting rid of the K1600, honest. I know you are all too polite to ask how much I paid, but for those in the know, £50 LESS than the last one. Now, where did I leave that mask? No comment... but you could say I just made one! ...and no, I don't think there is an end to the madness, once you have the pox, there is no Known cure. 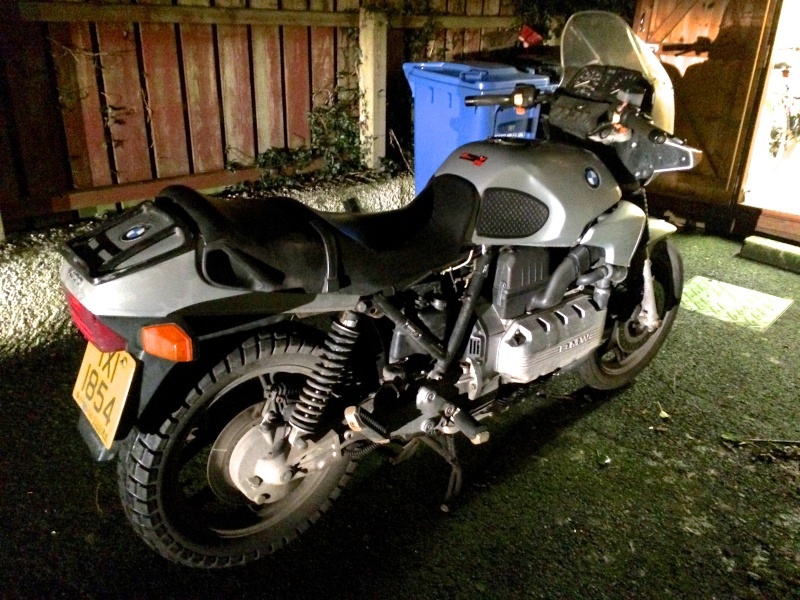 I've been keeping a weather eye on eBay for a second (third) bike, but nothing in my price range yet (near miss on a K1100 RS). I have a pet Aussie at work - he rides bikes but has not fallen for the K's yet and I am determined to a: convert him and b: bring him over to the Emerald Isle so he can see what riding is really about. Good on you mate, another K will be saved, and it's the medication one needs for K pox. Born again knows what he's talking about. Atlantic Way on a busy day. I believe you...but comparing the UK and the Republic of Ireland with Australia we are limited to about 4% of the space you have and have nearly 3 times your population to fit on it. 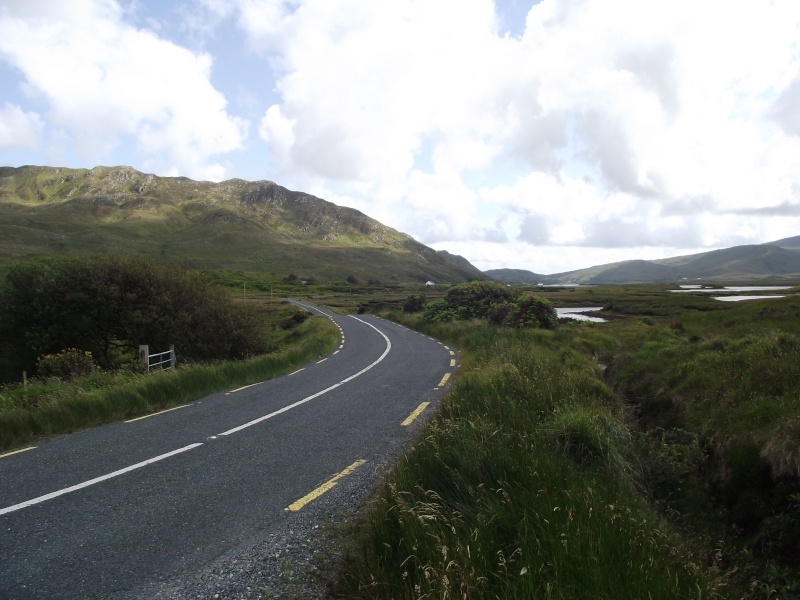 Hence we have to be a bit more selective about our "good roads"....and Comberjohn gave a glimpse of one of the better selections! I'd hate it if my friend went home in a year or two without having at least sampled some European riding at it's best. Here's a couple of photos of the orphan after I got home this evening. It's a bit rough but all there bar the side panel. Started this morning but wouldn't this afternoon. Would like to sus out the problem before I start to take it down. It'll have to stay outside tonight until I can reorganise my shed tomorrow. But there again, it's been living on the street for the last six months anyway. The PO told me that he has never washed it! It's amazing the abuse these things will take, although I think I might have saved it just in time. I'll give it a good wash in the morning and get a better idea what I have. For the first time I have the luxury of having a serviceable bike as well and can take my time on the refurbishment of the brick. This has all happened so quickly that I haven't had time to plan what to do yet. Not going down the cafe racer route. My opinion is that it's been done to death a bit. Old tourers never die, they turn into cafe racers. Just my opinion. 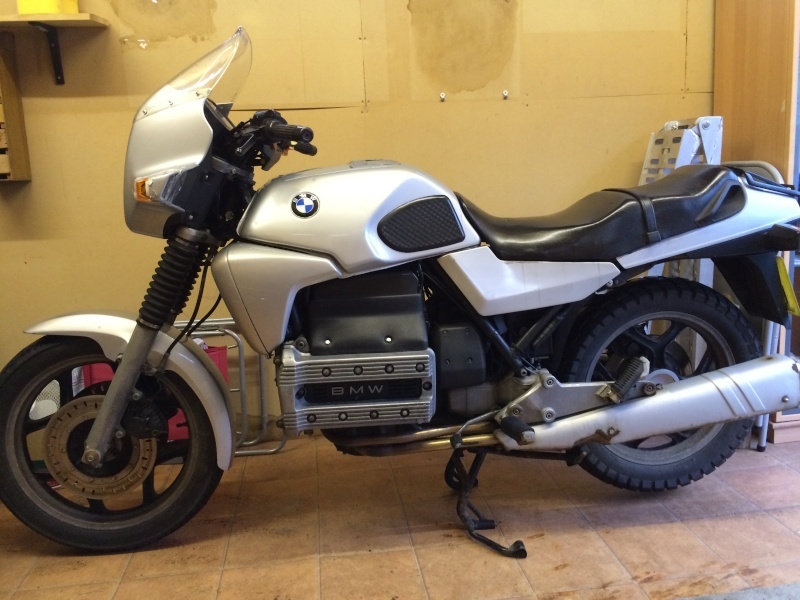 Torn between going down the bog standard K100 route or a very mild custom. Standard K100's are getting rare now. Or might just change colours and details a bit. Need to do a bit of research. Feel free to comment, guys. Opinions gratefully received. Welcome back Comberjohn he has returned to the fold. We need to be gentle with him as he hasn't yet figured that you are supposed to ride and cherish them and spoil them with lots of new parts and oil changes and filters. Have fun John and my opinion is keep it fairly much standard with your own personal refinements as it is a classic. Excelent Comberjohn! Once you get the start/run issue fixed it will be a good project. Looking forward to following its progress. Welcome back...what year model would it be a nd how many miles on the clock? You will need to accept that, once again, you are going up in the world. It's an '86 with 67k miles on the clock but it hasn't worked for a while. Would say it's probably just over 70k as it has an MOT test on it and it would have worked then. I'm inclined to lean towards completely standard rather than impress my 'vision' on it. At least I'll have a plan and know what I'm looking for. Not sure whether to keep the handlebar fairing or not. It's from a K75 and needs a slight repair at the indicator, but the lens is damaged. It might be harder to find. If I could find an original headlight surround I think I'll change it back. I think it's the radiator covers that are made of unobtainium and are ultra rare. It's going to get a rare treat this morning, a good wash. The seat with the handles in it comes from an earlier bike, 83 to mid 85 and the same for the tail. Could it have been a police bike as they often have had the solo seats replaced with ones from a different time? Did wonder about the seat. Although it has the early foot rest plates. Had the early side panels, too. Well, one anyway. Could be it was first registered in early 1986 and was the last of that model. Haven't got the full paperwork yet. Don't tell me I've been sold a pup and its a year older than I thought! Well, it's a dog then, isn't it? If you decide to go the naked route I've got a pair of front indicators you can have. May end up keeping the K75 handlebar fairing. It does keep a bit of wind off and keeps the area around the clocks and headlight tidier looking. Something I found difficult when I took the fairing off the RT. Needs a very slight repair at the edge of the indicator housing and a new lens. Thought the lens might be hard to find but noticed they are the same as the rear indicators. In the man cave after it's first wash. You can see the slight damage to the left indicator. Shouldn't be hard to fix. In it's new home at last! Still need to do a bit of reorganising in the shed. I'll start a new thread once I start to refurbish it. Some of the wiring is a bit ropey which may be causing some of the problems. Some of the loom has been nipped at the steering head. Need to charge the battery and see if I can get it to start again before I begin to strip it. OH great, he has rocket launches for exhausts on his K1600. Triumph had something similar on their T150 Trident. They called them 'Raygun' silencers. Did a VIN number check. It was manufactured in July 1985 and is the K100 83 model. Just wasn't registered until sometime in 1986. We don't care what you ride as long as you're still one of the Irish Eccentrics! Nothing insecure about me, mister. 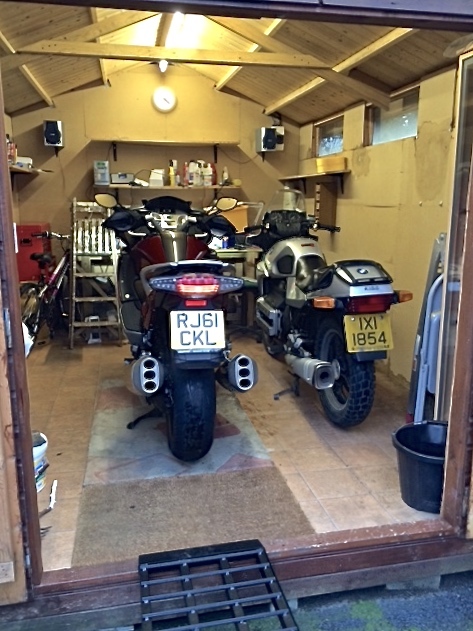 Both bikes securely locked up in the shed. Maybe see you next month. @Comberjohn wrote: Triumph had something similar on their T150 Trident. They called them 'Raygun' silencers. That reminds of my days in the Army. 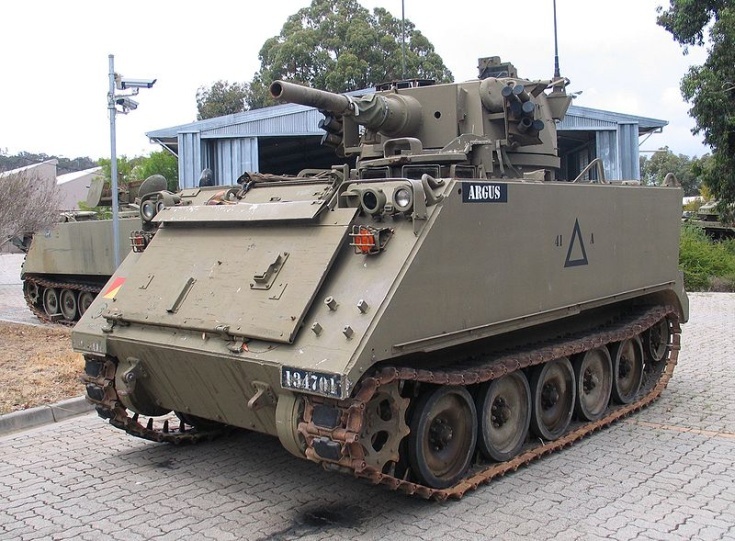 Some of us from my Regiment were taking 2 M113A1s (Armoured Personel Carriers) from Tamworth to Singleton. A semi-trailer driver had cut off the second Carrier and startred to tail-gate mine. So I swung the cupola around (it had 2 .50 machine guns in it). Boy did he pull up fast. The other Carrier overtook him, He stayed well back until we stopped for lunch 2 hours later. My Sargent and Squadron Officor officially wrapped me over the knuckles, then took me down to the Mess and bought a few beers. @larrikin wrote: That reminds of my days in the Army. Some of us from my Regiment were taking 2 M113A1s (Armoured Personel Carriers) from Tamworth to Singleton. A semi-trailer driver had cut off the second Carrier and startred to tail-gate mine. So I swung the cupola around (it had 2 .50 machine guns in it). Boy did he pull up fast. The other Carrier overtook him, He stayed well back until we stopped for lunch 2 hours later. Reminds me of a little incident on a school bus where a year 12 student grabbed a younger boy by the shoulders and bumped his head on the roof of the bus to discourage him from bullying even younger primary school kids. The unofficial response was 'well done, good work.' He was a very decent young man. I reckon the driver would have had to change his knickers at the next truck stop. BTW the guns weren't loaded. Are you sure they are secure? Apart from the door frame, that shed looks like it is made from cardboard. @Comberjohn wrote: Did a VIN number check. I was going to ask as a lot of the parts look like on my 84 RT. Seems you got the last of the earlier 83-85 model. A quick check as the side panel, footrest hangers, seat and rear cowl already suggest it, check the petrol tank, if it has the single bolt at the rear to bolt it in place, then it will have the multiplug connector into the fuel tank at the front left. That can get dodgy......been there. With a few removals of the tank the fuel lines, if old, are likely to crack so you should be replacing them and the breather pipe. There were some of those hanging around from one year to the next. So now we will hopefully see you back on a real K..... Its nice though to be able to do it in your own time and still have a bike running. Was putting the battery on charge this evening and decided to try to start the bike. No problem. Started easily, ran for a few minutes then cut out. Restarted but only ran for a few seconds before cutting out again. It stopped as if the key was turned off and after having a quick look at the wiring under the seat, I'm confident that's were the problem lies. Lots of bits taped in and non standard connectors. It's a bit of a mess with the outer wrapping off the loom around the steering head were it has been trapped. Haven't done much with it yet but will get a better look later in the week. Think it's going to be a loom change or complete remake of it. With the bike cold, take the cover off the Hall Effect sensors and hit them for a minute or so with a hair dryer until they are just a bit too hot to touch and try to start the engine. If it doesn't start or it quits quickly before the rest of the engine gets hot you may have found your problem. With the cover off put a fan on them and see if the engine runs longer before cutting out. John - want me to come up and take a squinty? I need to talk to you seriously about four wheels anyway. Had thought of the hall effect sensors but when it starts it's only running for a couple of minutes. Then it stops, restarts for maybe 10 seconds and won't start again for some time. There's no real change in the temperature of the head in this sort running time so can't see it affecting the hall sensors. Although I agree, it's the first thing you think of. The P.O. did ascertain that there is no spark when it cuts out. While the wiring certainly needs attention, the way the problem repeats itself would indicate that it's maybe a component. And so we're back to the hall sensors! Been flat out this week so haven't had a chance to get a good look at it yet. Charged the battery so may get a chance at the weekend. Could it be that a very small change in temperature could cause them to fail? This thread has run its course so I'll start a new one specifically about the problem. Might take you up on that, Dai. Want to have a play with it first. It's a man thing! Anytime your ready about getting your other licence. Shouldn't be hard to get you ready as you already have experience of being on the road. You should start getting ready for the theory test. It's changed a lot since you did your bike test! I have a spare ICU and FICU if you want to do swap-outs? You know my opinion on the validity of the Theory Test but... the law is the law. I'd better get another DVD and learn how to pass the multiple guess. That would be great, Dai. Being able to swap units could be helpful. It was doing the same thing before but the starter didn't always work. The P.O. replaced the unit behind the steering head and while the starter always works now, the original problem remains. Say when. I've been off work with 'flu this week but the short walk from Clough to Jordanstown shouldn't do any harm . Today is the first day since last Thursday that I haven't gone back to bed in the afternoon - hooray!!! Oh - and I'm not infectious anymore. Officially the infectious period expired on Tuesday. If you were a horse, you would be put down. Horse flu? I've heard of swine flu but that's a new one on me. Ahhhh.... I've just caught up with you!!!! It's not been a healthy three months. Try to keep up. It's just your age. Well, the K100 is a runner, for a while at least. Was fiddling about and got it started and kept it running for nearly half an hour. Even the fan came on! Restarted it a few times over the next hour or so and no problems. Reset the tickover and sorted the twistgrip to take an excess of play out of the cable. The TB's need synced but will do that after I check the valve shims. Enjoying getting my hands dirty again! Although they'll probably hurt tomorrow. Mind you, when I started the K16 to put it back in the shed, it still gives me a buzz. Ah, the best of both worlds. I think I may have sussed out the problem with the intermittent running. Found a key switch under the seat in the cowl with on and off painted beside it. Also found a black, plastic box about the size of a cigarette packet in behind the left side panel. It has six wires that are taped into the loom. It also has a 'Spyball' sticker on the tank. Anyone else think an ancient alarm/immobilizer could be causing an intermittent problem? I think this may be a transition build. Either that or its an ex police bike, although the correct paint code is under the seat. It has the early seat, side panels and footrest plates but the later tank with the clips(missing) at the back to hold it on. No insulation underneath the tank. According to the VIN it was built in July 1985 but not registered until mid 1986. @Comberjohn wrote: It also has a 'Spyball' sticker on the tank. when it comes to vehicle electrics. changed early -85.........the seat was changed at the model year change. If it is a Spyball alarm it must be a very early one. It's a simple component box with four small star head screws, two are missing, about the size of a packet of cigarettes. It was strapped to the loom with a cable tie. There's quite a few wires and connectors that are taped up that are non original. The earth screw above the gear shift has an additional two wires attached to it. Tomorrow, I'll have a look in the box and try to work out how to remove all of the non standard wiring. Pretty certain that this is where the running problems have came from. The cover fell off the TPS and I noticed that there was a little oil inside it but I don't think there was enough to affect starting. Something that will have to be replaced though. @Comberjohn wrote: The cover fell off the TPS and I noticed that there was a little oil inside it but I don't think there was enough to affect starting. The TPS won't affect starting, but if the idle switch is shorted it won't run above 2K rpm. It revs ok. Unplugged it earlier to try it anyway. Sounds very much like the problems the previous owner was having. Possibly with me poking about behind that side panel it has effected a temporary cure. Certainly wouldn't trust it to travel too far yet. If it is a Spyball alarm it's a very early one. I'm guessing that's what make it is by the sticker on the tank. Another sticker says 'Fox Security'. Seems to be a common problem with this type of alarm after a while. It has been well integrated into the loom and I'll need to tread cautiously when removing it. Was out for a run on the K1600 today so didn't get a look at it. Only 6C but sunny. Tomorrow is to be wet and windy so I'll take the tank off and get a good look. I'll take a couple of pics for reference. At least I know it's a runner now.